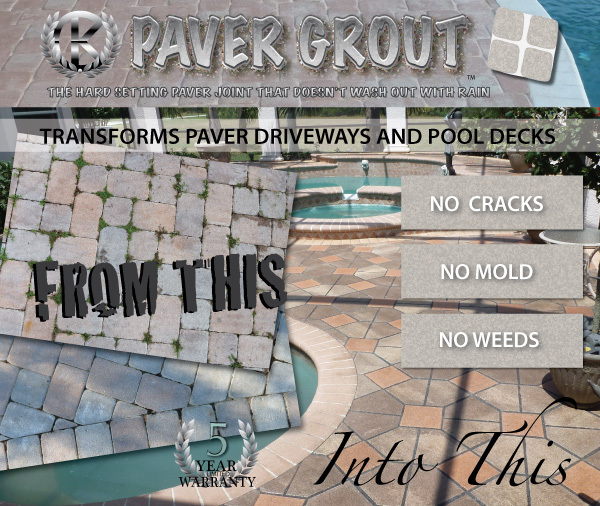 Welcome to Paver Grout™ the Architectural Grade flexible jointing system for paver driveways and pool decks. Imagine a driveway that never gets stained and where weeds never grow, this is the ultimate long lasting low maintenance surface finish for residential pavers. No More Weeds, No More oil stains, no more time spent pressure cleaning, just a beautiful always clean paver driveway or pool deck. The Paver Grout™ hard setting, jointing and sealing system dramatically increases the Kerb Appeal of residential homes making them much more exclusive and desirable. In Florida keeping paver surfaces looking clean is a constant challenge, regular power washing is necessary to remove all the dirt and mold from the joints and weedkiller is often sprayed on paver pool decks and driveways to keep weeds from growing. According to emerging research the weedkiller Glyphosate commonly known as Roundup is extremely hazardous to human health, Some weedkillers can also permanently stain pavers and other concrete surfaces. We recommend customers DO NOT use weedkiller on paver pool decks as the toxic chemical residues can be absorbed through the skin when wet feet come into contact with the pavers. Please read the warning label carefully before using Glyphosate to control weeds on paved areas used by children. 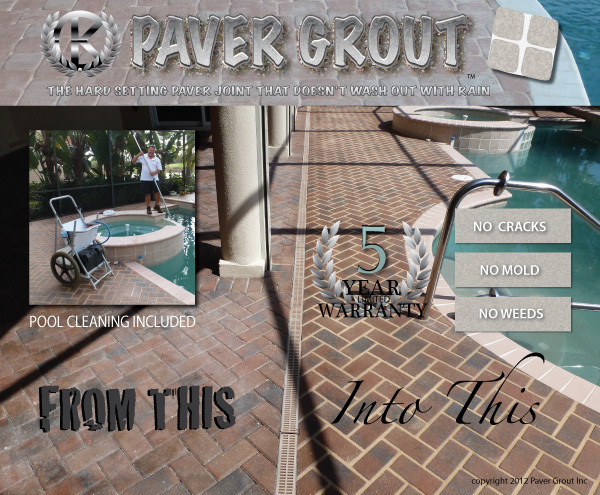 Paver Grout is a natural looking and non toxic alternative to maintaining a weed free driveway or pool deck. 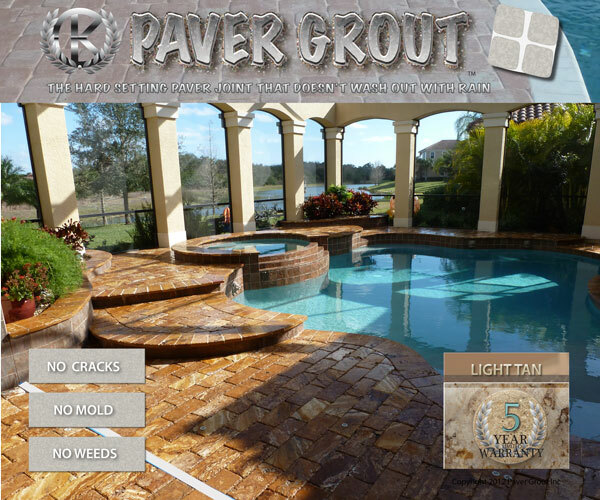 Paver Grout creates a smooth impermeable joint that prevents weeds and algae from growing on the surface of your pool deck or driveway pavers. 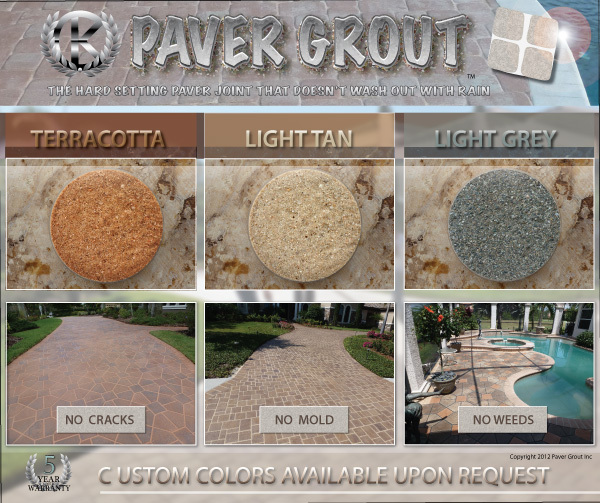 Paver Grout is available in three standard colors, Terracotta, Light Tan and Light Grey, custom colors are also available on request. To help keep the surface of your driveway and pool deck clean we apply a finish coat of a high grade urethane sealer. The sealer helps to protect the Paver Grout from getting stained and prevents mold and algea from growing on the surface. 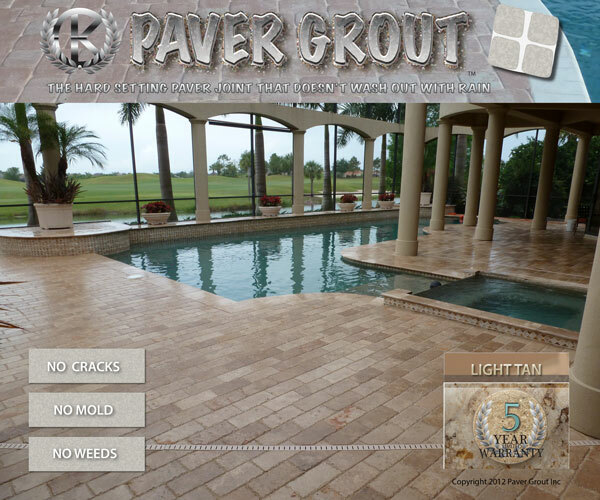 Paver Grout is the ultimate surface treatment for paver pool decks and driveways. Call us for a FREE quotation today and start enjoying your pavers again. 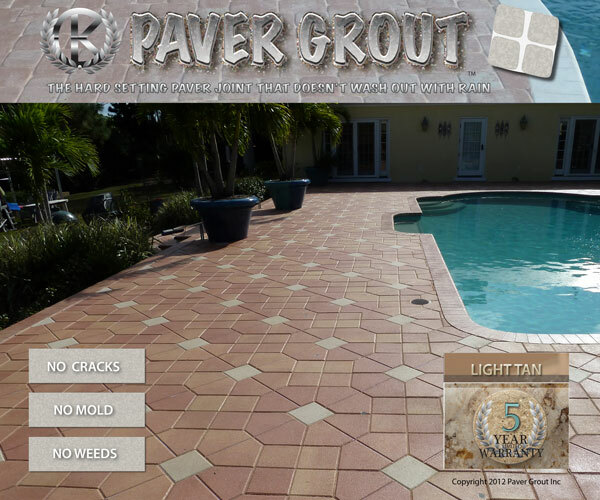 TELEPHONE (941) 600 2133 TO SCHEDULE A FREE NO OBLIGATION SURVEY BY THE KC GROUP YOUR LOCAL PAVER GROUT™ APPROVED AND LICENSED CONTRACTOR. The cost of sealers ranges from as little as $16 a gallon for a Xylene/Acrylic to over $85 a gallon for a 2 part catalysed Urethane and up to $145 a gallon for DuPonts Enhancer Pro Travertine and natural stone sealer. Urethane formulations are the hardest and longest lasting surface sealers available. If you're pavers have turned white this is probably due to the contractor using a cheap Xylene/Acrylic sealer, visit our paver restoration section to find out how to restore color to pavers that have turned white. If you are getting quotes for paver sealing it is important to ask your contractor to specify exactly what type and grade of sealer you will be getting so that you can compare like for like. 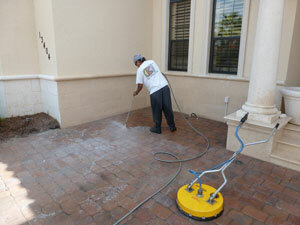 Before you have your pavers sealed you should take the opportunity to have them professionally cleaned. Our specialist surface cleaners deep clean the pavers removing all of the accumulated mold and dirt in the paver joints. Most builders in Florida use masons sand to fill in the joints in pavers, even with a sealer applied masons sand will wash away during heavy rain storms. 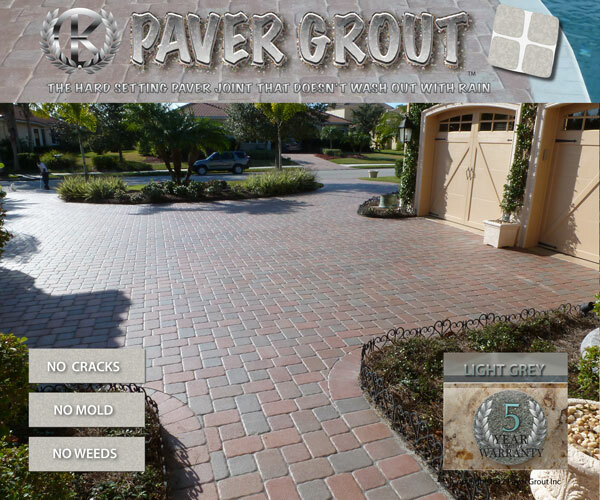 Why use KC Paver Grout? 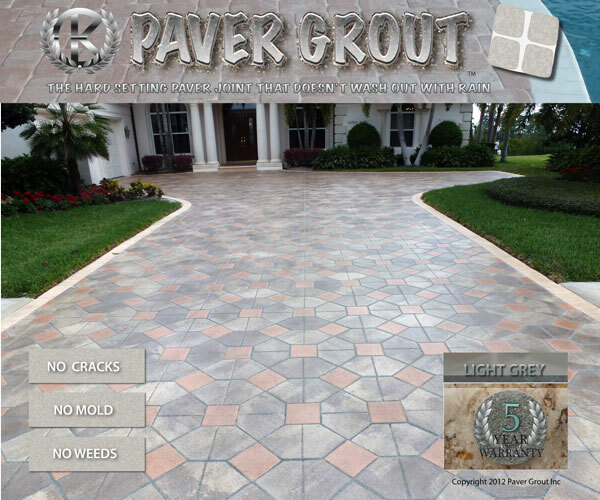 KC Paver Grout is an Architectural grade mix of polymer modified silicates and other additives that creates a hard setting, natural looking joint that doesn't wash out with rain. 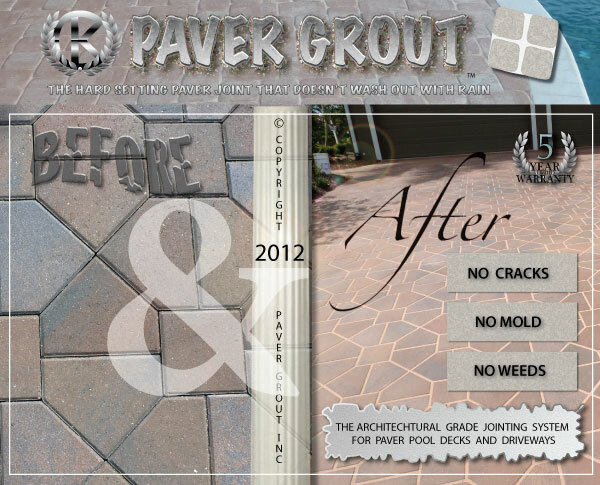 KC Paver Grout is weed and insect resistant. 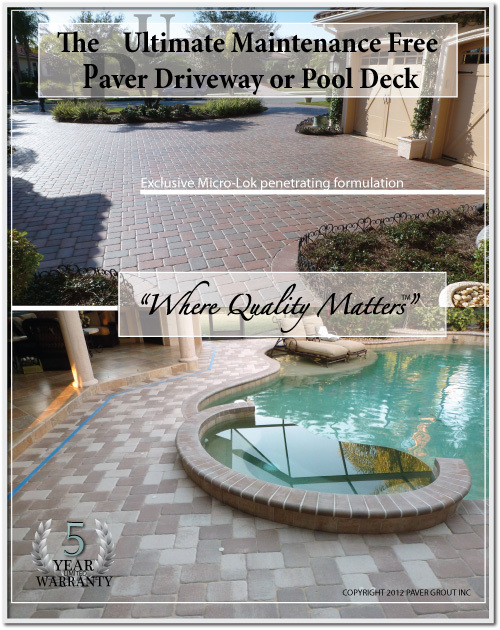 In Florida choosing the right kind of sealer for your pavers is particularly important if you want long term protection for your paver driveway or swimming pool pavers. The cheapest and most widely used form of paver sealer is xylene/acrylic sealer, it looks good for a few months and then fades very quickly, it seals the surface but does not allow the paver to breathe, this can trap moisture under the surface of the sealer causing the sealer to turn white, we do not recommend Xylene/Acrylic sealers for this reason. California has banned the use of Xylene and Toluene because of its toxicity and high VOC. Sealers based on a cross-linking Urethane blend have a far high wear resistance than Xylene/Acrylic, they do not fade like Xylene/Acrylic and are safer to handle and safer for the environment. WHY SEAL MY PAVER DRIVEWAY OR POOL DECK ? The primary function of sealers is to protect the surface of the material to which it is being applied, a secondary function is that it also brings out the colour of the pavers making them look more attractive. The most important characteristic of any sealer is it's hardness and in the hardness test Xylene/Acrylic sealers do less well than the more advanced range of sealers now commercially available which use cross linking Urethane. WHAT IS THE BEST SEALER FOR MY DRIVEWAY OR POOL DECK ? KC Paver Sealer is a very advanced cross linking Urethane Paver Sealer. It is harder wearing, out performing Xylene/Acrylic on abrasion and hot tire pick-up resistance. KC Paver Sealer is also a sensible choice for the environment as it does not contain any harmful solvents or other volatile organic compounds. KC Paver sealer is specially formulated to activate and set the KC Paver Grout, the resins in the Urethane add considerable strength to the paver joint. KC Paver sealer comes in both a low lustre natural finish and high gloss finish, the sealer is applied by spray or roller depending on the surface and the type of sealer being used. HOW LONG WILL IT TAKE TO GROUT AND SEAL MY DRIVEWAY OR POOL DECK? Most jobs can be completed within 2-3 days, after application of the sealer your driveway or pool deck will be ready for foot traffic within 2hrs, in normal conditions it will take heavy traffic after a period of 24hrs, longer curing times may be required depending on the ambient temperature at the time of sealing. The close-up photograph to the left demonstrates the water repelency of the grout and pavers and the solid clean Paver Grout joint. Due to the technical nature of grouting and sealing, we strongly recommend contacting a reputable and experienced company like ourselves if you are considering having a driveway or pool deck grouted or sealed. KC paver Sealer is an Advanced Cross Linking Urethane formulation which out performs xylene/acrylic and water based acrylic sealers. Does not suffer from surface "Ghosting" is a Low Odour and low V.O.C meaning it's safer for the environment too. Provides long lasting protection for decorative paver driveways and swimming pools. Why wasn't my paver driveway or pool deck grouted or sealed by my builder or installer? Some Builders or Installers do offer a finishing service but not all, so it will depend on which contractor you got to do your paver installation. During the construction boom in Lakewood Ranch and Sarasota homes were being built so fast that most builders did not go to the extra trouble of hiring contractors to grout and seal the pool decks or driveways. 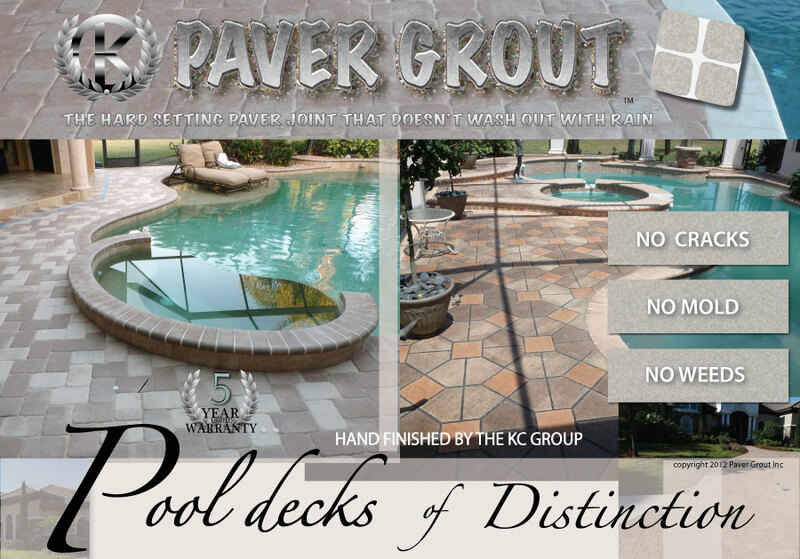 The KC group is a trusted and respected name in Bradenton and Sarasota for professional finishing of paver pool decks and driveways. 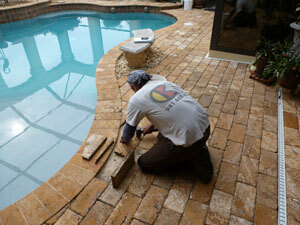 We include in our quotation a professional pool vacuum clean after we have completed the restoration. 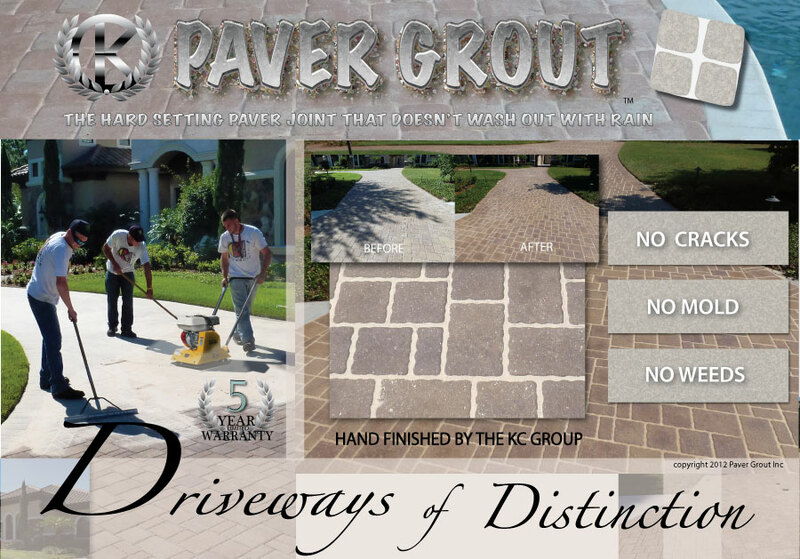 KC Paver Grout is the natural choice for professional paver finishers, its hard set and natural look compliments any paver as you can see by clicking on the examples. This paver driveway in Lakewood Ranch Florida had been previously sealed with a xylene/acrylic sealer. To prepare the surface we deep cleaned it and scarified the surface to provide a key for the new sealer. The Paver driveway was finished with our light grey paver grout and then given 2 coats of our premium grade urethane sealer. Sealing the pavers after grouting helps to protect the paver surface from staining. It also helps to bring out the natural colours of the pavers. Dirt, mold and algae cannot stick to the paver surface and the sealer locks away moisture which most algae require to grow, this guarantees a maintenance free driveway. This City Diamond paver pool deck has been finished with our Light Tan Grout which is a perfect match for the pavers. When the paver grout had set it was then given one coat of semi-gloss paver sealer. Sealing the pavers after grouting helps to protect the paver surface from staining. It also helps to bring out the natural colours of the pavers, sealer finishes range from flat to a glossy "wet look". There are several different types of solvent and water based paver sealers on the market we strongly recommend a commercial grade cross linking Urethane sealer for residential pavers. This Belgard "City Diamond" paver driveway in the Country Club Lakewood Ranch was finished with our Terracotta Paver Grout. 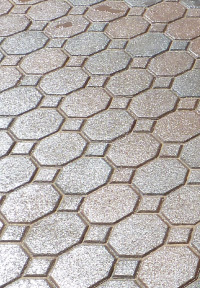 The grout helps to highlight the geometry of the pavers which have been laid in a horizontal straight pattern. The client had been spraying weed killer to keep the weeds down and was very keen to have the deck grouted and sealed to prevent weeds from growing. We do not recommend spraying weed killer on pavers as they can be permanently stained by the chemicals in the weed killer, also wet feet can pick up the chemical residues which can then be absorbed by the skin. 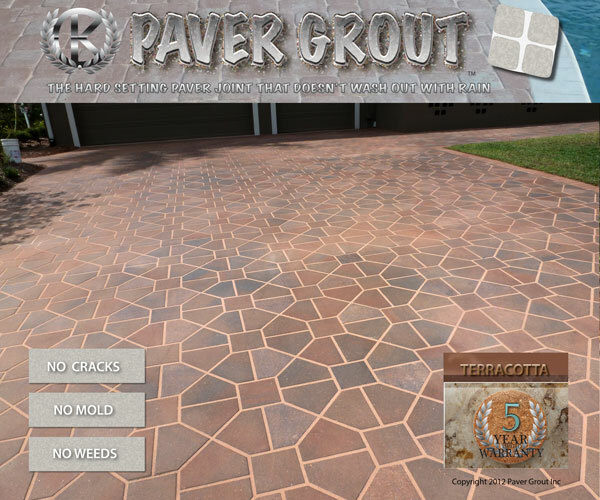 Paver grout is a safe and effective solution for paved areas, it is guaranteed from lifting peeling and cracking or 5 years. 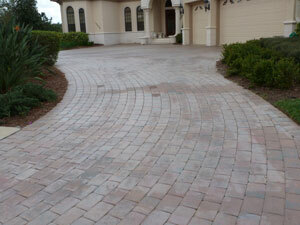 This "City Diamond" paver driveway in Waterlefe Bradenton was finished with our Light Grey Grout. Remedial work consisted of stripping off the old sealer layers, some levelling work to correct rocking pavers and re-setting of the kerb edging pavers to bring them even with the top of the kerb edge. After the remedial works were finished the pavers were grouted and the activator was applied, after the activation coat the pavers were sealed, the finished driveway is shown on the left. No Mold, No Weeds just a beautiful low maintenance driveway. 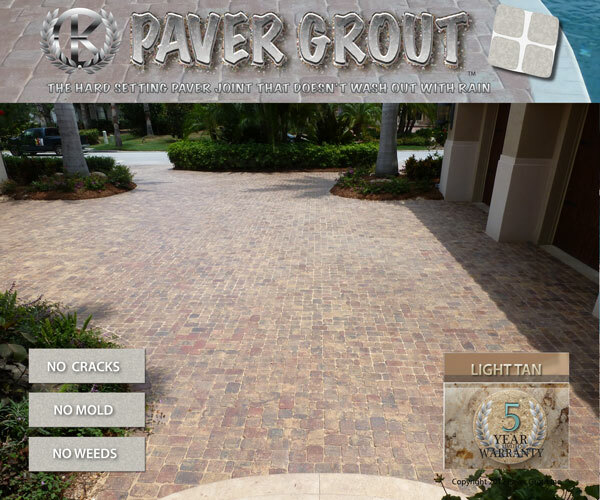 This Hanson tumbled Paver driveway in Lakewood Ranch Country Club was finished with our Light Tan Grout. Tumbled pavers have more rustic cobble look to them, preparatory remedial work consisted of some paver levelling work to correct sunken areas, removal of gum and other surface stains and then swapping out of some oil stained and damaged pavers. After the remedial works were finished the pavers were grouted and the activator was applied, after the activation coat the pavers were sealed with 2 coats of our premium grade urethane sealer. This incredible Travertine paver pool deck has been finished with a high gloss wet look sealer. We offer a 5 year guarantee against fade using this architectural grade 2 part urethane coating. The finished effect is dramatic and alluring, the wet look brings out all the colors and patterns in the marble. The wet look can transform outside spaces providing a very low maintenance surface that can be easily washed down. We recommend that wet look sealers have a fine grit added to the top coat to increase traction and make the surface non-slip. This beautiful Travertine paver pool deck in Lakewood Ranch was Grouted with our Light Tan Paver Grout and then sealed with our wet look Travertine paver sealer. Travertine is a soft natural stone and can be damaged by acidic liquids which includes salt water swimming pool systems. Rermedial work included swapping out over 90 pavers that had surface damage as a result of spilled liquids and water from the swimming pool. With the remedial work completed we gave it 1 coat of our wet look sealer with a slip resistant additive to provide better traction. The sealer bought out the deep rich colors in the Travertine as you can see in the photographs. 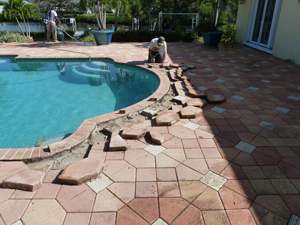 Pavers around pool decks often sink due to settlement or washout of the paver base sand, or the substrate the sand is laid on, before we repair the affected paved area we need to determine if the cause for the pavers sinking is due to settlement or washout of the substrate. Settlement occurs most frequently around the edge of pool decks and this can cause the tiles to drop or go out of alignment, this is nothing to be particularly concerned about. An effective remedy is to lift out the affected pavers and fill in the holes underneath packing the sand tightly down and then re laying the paver, it is unlikely that there will be any further movement of the pavers. To take out the pavers place a thin bladed knife either side and rock the paver back and forth to loosen the edges, the paver will gradually become loose enough to life out easily with your fingers. Some pavers are laid very tightly and you may need to hire a contractor with a paver lifting tool to remove the pavers for you, the most common reason for lifting out pavers is due to oil spills, we recommend using a high grade urethane sealer to prevent damage to the pavers from oil spills. If washout is the problem this may be caused by an underground leak and not necessarily from the spilled water from the pool. If you are having to regularly top-up your pool with an unusually high am mount of water this may suggest that you are losing water from a pipe leak and this is what is washing out the substrate and causing the pavers to sink. Visit our PAVER REPAIR SECTION for more information on what to do if your pool deck pavers are sinking or you have water ponding on the surface of your pavers. 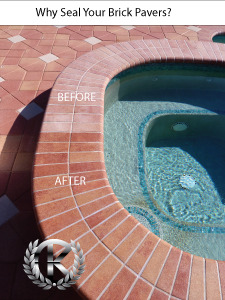 We highly recommend that customers have their pool deck pavers grouted this will stabilise the paver joints and prevent the pavers from going out of alignment. Paver finishing is something that should be left to experienced contractors, we offer a sealer stripping and restoration service for paver surfaces, this process removes old or failed sealers restoring the surface of the pavers back to the original colour. The most common reason why cheap Xylene/Acrylic sealers fail in Florida is due to Hydrostatic pressure trapping moisture under the sealer, turning it a milky white colour. We do not recommend the use of Xylene /Acrylic sealers for this reason. Unfortunately Xylene /Acrylic sealers are among the cheapest and therefore the most widely used by the majority of paver sealing contractors. For customers who are concerned by health or environmental issues Xylene contains chemicals known to cause cancer, Xylene among other solvents has been banned in California, Xylene also has an extremely high VOC rating which means the solvents have a negative impact on the earths environment and atmosphere. If your pavers have turned milky white and the sealer is a Xylene /Acrylic the condition can sometimes be corrected by re-setting the sealer with solvent, for cheap water based acrylic sealers this condition is irreversible, to restore the pavers the old sealer must be stripped off. Visit our PAVER SEALER STRIPPING page for more information. The KC Group strongly recommend our advanced architectural grade cross linking Urethane Sealer for residential decorative pavers, the sealer is typically harder and because it can breathe moisture cannot turn the surface milky. Our KC Paver Sealer is proven to out perform cheap acrylic or solvent acrylic formulations it is harder wearing and longer lasting. Consult a paver finishing specialist like ourselves if you are considering having your pavers sealed. The KC Group offer a paver restoration service for older paver surfaces, this process involves cleaning and removal of old or failed sealers, grouting of the paver joints with Paver Grout™ and then sealing of the surface of the pavers with a high quality Urethane sealer. Our restoration service transforms old paver driveways and pool decks making them look clean and solid again. The pictures on the left are of an 8yr old paver pool deck in Waterlefe Golf and Country Club. Despite the age and wear on the face of the pavers the restored finish is far more pleasing to the eye and much easier to keep clean and sanitary. KC Paver Grout is insect resistant so thankfully ants and other insects won't BUG you so much. "Before I hired the KC Group to clean and seal my pool deck and front walk, I asked them for references. They provided names of several former clients in my neighborhood, and all of them were very happy with their work. My husband and I were very pleased with Tom's courtesy and professionalism. He met with us and provided a written estimate and the final cost only varied from the estimate because of the additional services we requested. Tom was very flexible in working with our schedule, so at least one of us could be home while he and his assistants were working on our home. He even came out on Saturday and Sunday, so he could finish the work before my out-of-town company arrived. Our pool deck and walk look better than new. I would definitely recommend the KC Group". Our commitment to quality is quite literally set in stone. 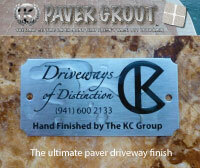 That's because we attach a stainless steel, laser engraved plaque with our name and logo on every driveway we complete, it represents a comittment to stand behind our promise to deliver high quality low maintenance paver finishes that last.